7 PAX desperately searching floorboards for change. 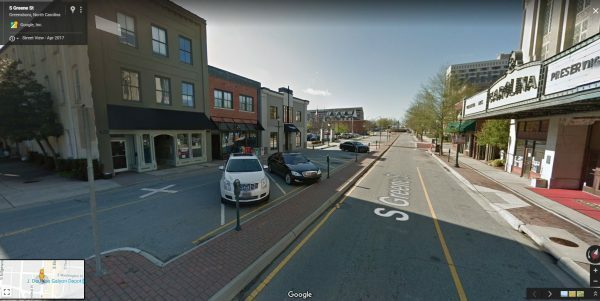 YHC was exploring various parts of downtown Natville looking for F3 opportunities via Google Street View (what, you don’t do that?) when he stumbled on this diamond in the rough. Do you see it? Waldo is hiding in the Cadillac! And, a median with a row of 13 evenly spaced parking meters stretching a solid 110 yard distance. Channeling his inner Monty Burns, YHC muttered “Excellent” much to the concern of co-workers in the surrounding cubicles. To kick things off, PAX lined up single-file and bear crawled the full distance, performing a merkin at each meter, planking at the end for the 6. Turning around and heading north, PAX performed lunges, with a jump squat per meter, Al Gore’ing for the 6. Back south, PAX ran high-knees, broad jumping over, or onto, the median, zigzagging their way down, SSH’ing for the 6. Once more north, crab walk with 2 crab cakes at each meter. Continuing the fun, PAX ran down Greene St until we bumped into the General himself. PAX counted off into groups of 4 and then stationed themselves on the 4 medians flanking the General, performing the exercises shown on the crudely drawn map below. 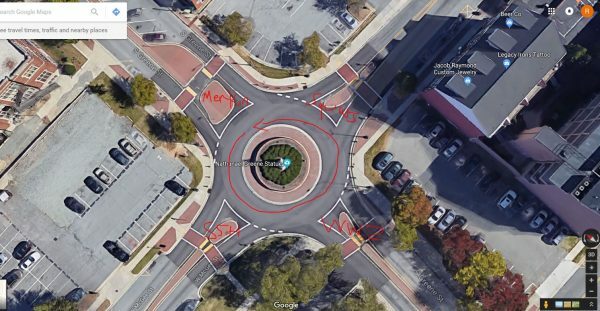 First PAX at the merkin station ran 450 degrees around the circle to tag the PAX at the next station, falling into the back of the line. The now-tagged PAX runs 450 degrees to relieve next station, and so forth. This needed some refinement, but showed promise. YHC will tuck it away in his files, which don’t really exist. Natville’s 4th birthday celebration, tomorrow! Cougar Town. Funnel cakes, petting zoo for the kids, free parking. Earhart took us out, challenging us to have Defiant Joy, and reminding us where that joy comes from.